I cannot begin to tell you how excited I am about this series of posts. As early childhood educators, teaching phonological awareness is so important! Children are stronger readers and spellers when they have a solid foundation of phonological awareness. I'm kicking off this series on the Building Blocks of Phonological Awareness with Listening. Before we get into listening, let's talk about phonological awareness in general. Phonological awareness is the ability to think about, recognize, and manipulate the sounds in spoken language. Phonological awareness activities work with rhymes, words, syllables, and onset rimes--all without the use of print. The last stage of phonological awareness is actually phoneme awareness: blending, segmenting, and manipulating phonemes (sounds). Phonological awareness skills generally develop along a continuum ranging from simple to more complex. Research suggests that phonemic awareness is the single best predictor of reading success. Because the skills develop along a continuum, we can't just start with phonemes! We must start at the beginning, ensuring children have a solid foundation in all phonological awareness skills. 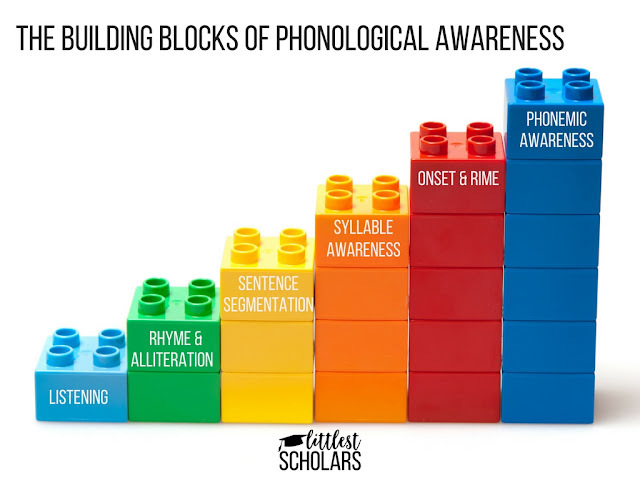 How do you teach phonological awareness? I've found the key to building phonological awareness skills in your little scholars and making them stick is to use kinesthetic motions and pictures--this way they are hearing, seeing, and moving! I also gradually release responsibility with the "I do, we do, you do" model, giving my little scholars lots of opportunities to practice and receive feedback. So, let's get on to listening. When it comes to phonological awareness, listening is more than just hearing. Listening is being able to "tune-in" to sounds in the environment and sounds that are spoken. For example, a child with strong listening skills will be able to listen to a series of sounds and name them in the correct order. For example, the child might hear audio clips of a sheep, cow, and horse. The child with strong listening skills will be able to select pictures in the order she heard the sounds. She'd pick up the sheep first, cow next, and horse last. One of my favorite activities to develop listening skills is playing bingo! Children are each given a bingo game board with a variety of pictures on it. You can make the sound or play audio clips as your little scholars identify the animal or object that makes the sound. 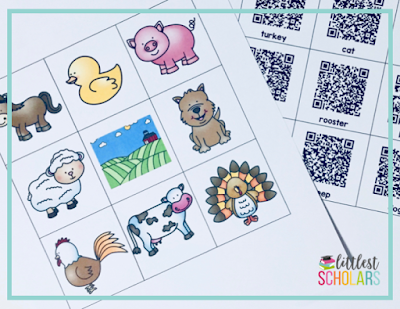 You can download the Farm Sounds Bingo pictured below for free in my Listening Activities printables. I've included audio clips that can be accessed by scanning the QR codes. If you are unable to scan the QR codes, you can always just make the animal sounds yourself. For this activity, place two or three animal pictures on the table. Make all but one of the animal noises and then ask, "Which animal did not make a sound?" Your little scholars should be able to identify the animal that was left out. I've included pictures of farm animals that can be used for this activity in my Listening Activities printables. Download it for free! Get those wiggles out and strengthen listening skills at the same time! Tell your little scholars that when the music is on they can dance, wiggle, and move but when the music is off they stop moving. Turn on some kid-friendly music and pause it intermittently as the song plays. This game is always a favorite in my classroom! Give children 2 or 3 step directions and encourage them to follow them in order. Start with two step directions until your little scholars have the hang of it. You might say, "Clap your hands. Touch your head. Jump up and down." This is a great activity to do during transition times! 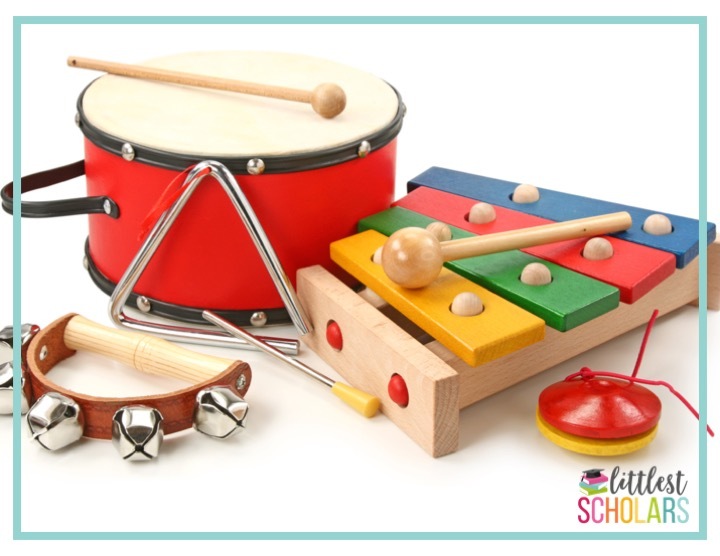 Set children's musical instruments on the table. 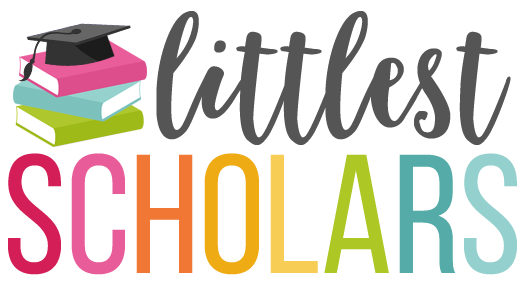 Ask your little scholars to close their eyes. Play 2 or 3 musical instruments one at a time. Ask them to open their eyes and play those instruments in the correct order. I have these musical instruments and they are a hit! 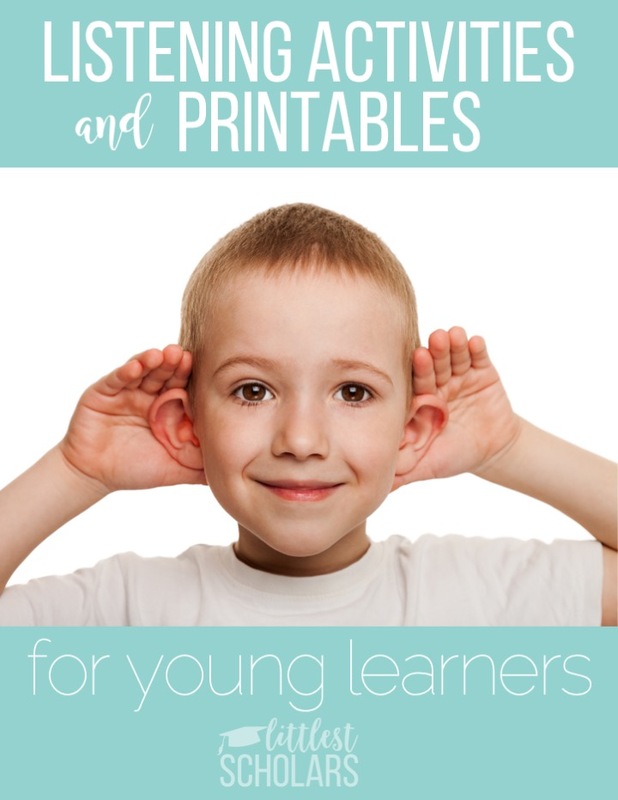 If you haven't already, be sure to download my free Listening Activities printables! 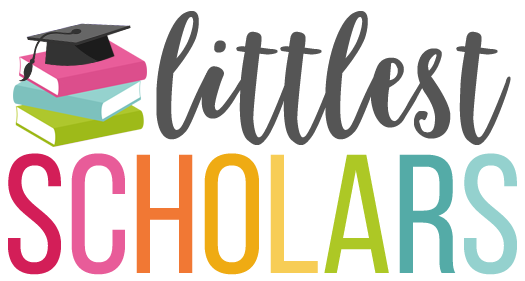 The next post in this series is about rhyme and alliteration and you can read it here. Also, join our Facebook group for more ideas!